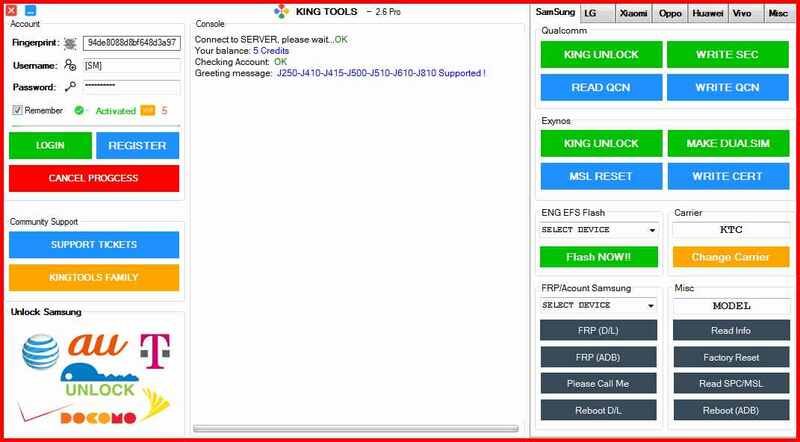 Kingtools is A Multi-Brand Tools Support many phones with Exclusive solution. All in One Tools For Repair Unlock Frp etc. It also allows you to remove the Xiaomi user lock, remove the PIN lock, remove the password lock on Xiaomi,Samsung,Oppo,LG Device. It also allows you to unlock the password lock on Xiaomi,Samsung,Oppo,LG device, remove the PIN lock, Remove the Pattern lock, remove the Face lock on Oppo devices. In order to use the MM Unlocker Tool properly, you need to install the Universal ADB Driver on your Computer. Once Driver is installed you can successfully connect your Android Device to the computer, and launch the KingTools on the computer. – Add Write Cert via Modem. – Add Reset MSL Qualcomm. – Bypass Please Call Me on Combination.